The human parvovirus, also known as fifth disease, is a virus characterized by a bright red facial rash that can extend through the arms and trunk, accompanied by symptoms like itching, fever, sore throat, upset stomach, and headache. While generally the virus is not life threatening, it can be very uncomfortable and unpleasant. It is most common in school-aged children during the winter and spring months and is spread from person to person just like a cold would be. 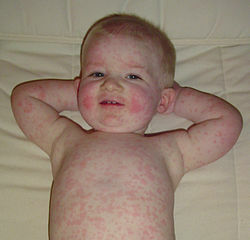 However, unlike a regular cold, fifth disease produces a red, lacy rash that looks like the child was slapped on both cheeks. Once your medical professional has confirmed that your child has fifth disease, there are a number of things that you can do to help give your child some comfort. Luckily, the parvovirus usually just runs its course much like the flu, and once your child has it, he or she will be immune. More than half of all adults are immune to the virus having unknowingly had it as a child. For other children, however, it’s important to keep an eye out for symptoms, as the rash only shows up at the end of the illness. This means the child was likely contagious for a few days before the illness was diagnosed. Ensure that your child is getting plenty of rest. Make sure he or she drinks plenty of fluids. Give children’s acetaminophen like Tylenol for minor aches, pains, and temperatures over 102 degrees Fahrenheit. Dosage is based on their age and weight and should be given under the care of a medical professional. Although the red facial rash is a good indicator, the best way to diagnose fifth disease is by seeking prompt medical treatment. Medical professionals at FastMed are here whenever you need them. We have extended hours during the week and even on weekends and holidays for your convenience. We also strive to be an affordable alternative to the ER for non-life-threatening conditions. We’re proud to provide our customers with quality care at their convenience. It is our mission to serve our communities and patients with a high level of quality, personal care, affordable and convenient urgent care, family practice, and other specialty medicine services. If your child is showing fifth disease symptoms, don’t hesitate to come by a FastMed near you.